Until Star Trek came around, The Adventures of Superman was my favorite series of all time. When I was a kid I use to run around the house with my bathrobe tied around my neck pretending that I was Superman.It could had been worst,I didn't jump out of any windows. I will not be watching but will play my dvds instead, WITHOUT COMMERCIALS! 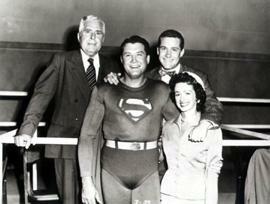 ME-TV has just announced that beginning in August they will begin airing the original episodes of Superman! Check with your provider for the channel number for Me-TV. I would really love to see those old Superman episodes again. Maybe I'll try youtube. Definitely one of my all-time favorite tv shows! 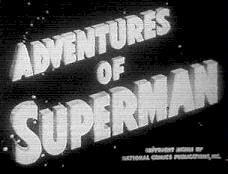 There were 104 episodes of Superman made.Only living members are Noel Neill and Jack Larson.There were 26 episodes made with Phylis Coates and 78 episodes made with Noel Neill.Kellogg`s cereal was the sponsor.Good show and has withstood the test of time.There were a few bloopers on the show.